The Nissan Maxima hit the stage in the early 1980's as an upscale sedan. The sporty four door vehicle was marketed to attract the buyer who wanted European design with family friendly features. The powerful V6 engine put the vehicle in a class by itself and created a loyal following amongst customers. Early models of the Maxima were built with optional manual transmissions and V6 engines. Capable of 160 hp, the 190 hp engine was not available until 1992 for the Maxima SE. The Maximas built between 1995 and 1999 saw the vehicle's quality improve greatly. Nissan improved the interior and made an all-aluminum V6 engine with 190 hp standard. The fifth generation Maxima (2000-2003) saw an improvement in handling and vehicle power. Greater leg room and a Bose audio system helped to make the car popular among buyers. The later models (2004-2008) proved to have more power and more space than previous models. There were now two trim levels offered and a more luxury feel associated. Some upgraded technology, 17 inch wheels and HID headlights round out the features. Customers who are in the market for a used Nissan Maxima can find that even models from the early 2000’s can prove to be a good investment. 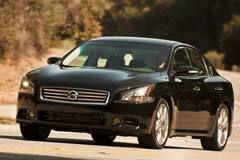 The powerful engine, luxury design and roomy cabin has given the Maxima a niche all its own. 2014 Maxima 3.5 SV 2017 DealerRater Texas Used Car Dealer of the Year! Come See Why!